The economic crisis in Greece has not dissuaded British travellers from visiting the country, in fact twice the normal number (four million) could be making the trip this year. The survey by Travelex, the travel agency, has stated that bookings for all-inclusive deals have gone up a third in the last two weeks as prices have dropped considerably. Travel insurance is always recommended to safeguard your holiday. 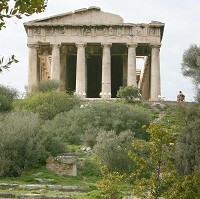 The strength of the pound against the euro had, the poll stated, encouraged the securing of holidays to Greece. In fact less than 2% had cancelled an already-booked holiday to the country, while 47% stated they would not change their plans whatever the economic circumstances there. Of those quizzed, about 20% were "not concerned at all" regarding the chance of a collapse of the euro in Greece, while most were only "mildly concerned." Half of those in the poll expected the euro to disintegrate in Greece, with most expecting it to happen before summer's end. Travelex's Elvin Eldic said: "It looks like when it comes to summer holidays, Brits are more concerned about bagging a bargain than whether or not Greece gets another bailout. "We'd urge Brits to not only take a mixture of cash and a prepaid card but also to take the time to check the terms and conditions of their travel insurance when booking a holiday or travelling to Greece."